Autumn Snow is the name of a pretty plant in my garden! I found the label, and it says “thrives in moist to wet soil”. Ha ha! No such thing in my garden, so I must have overlooked that! 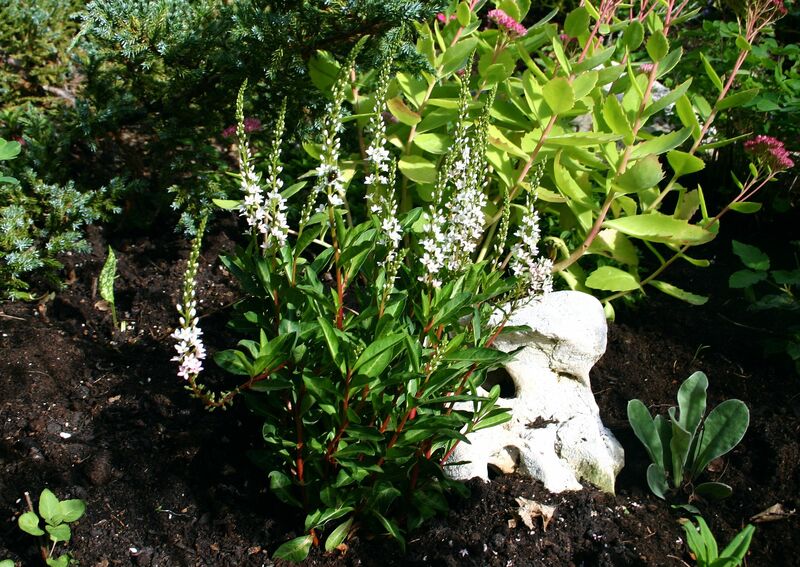 It does, however, like full sun or half-shade, well-drained soil, and warmth. I have two in my rockery… this new one has been given a place of honour next to my newly found rock. It is evergreen, with lovely glossy oval leaves which turn reddish-brown in autumn. Its growth is upright, and it may spread by underground rhizomes. Mine hasn’t spread, possibly due to its rather dry position. 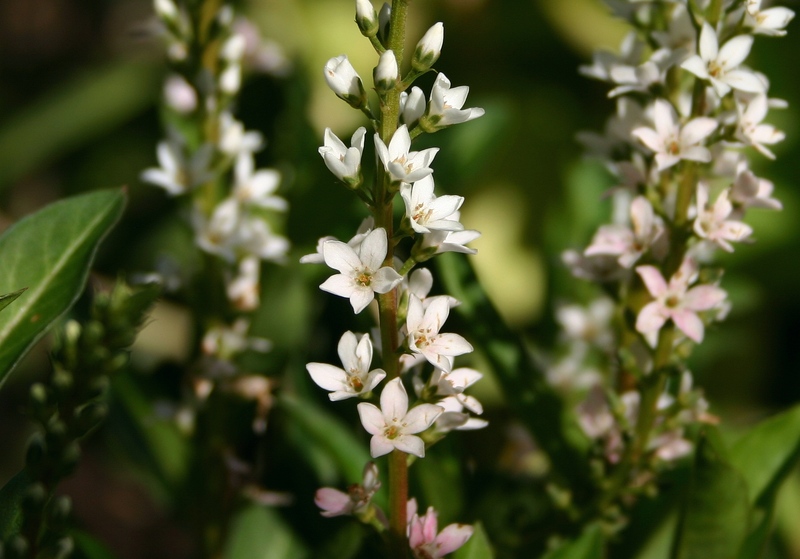 As the spires of little white flowers slowly open, they curve – like a goose neck, or ducksbill! Extremely hardy, this perennial has pretty foliage and stems, and flowers from mid-August till late autumn. It also tolerates drought, but would prefer a bit of moisture. I like it when the spikes start to curve, as they all curve in the same direction, which looks quite cute! This entry was posted in Garden, Nature, Plants and tagged Autumn, Garden, Nature, Plants, Summer. Bookmark the permalink. Thank you Phil. Have a nice weekend! I was wondering about the title, I’ll admit. 🙂 We have a flower that pops up in the spring called the snowdrop. I love how a bloom with that kind of name signals the return of warmth. But for now: autumn. I do love this season. Hi Emily. Thanks for commenting. Autumn is what I long for all year! Can not wait to get my camera out of her case and full of fall color. I really like it. I do not have enough evergreen plants in the garden. I would like to try it to get such lovely flowers at this time of year. Has your sedum attracted many butterflies? Mine is not attracting butterflies and I have several bushes in different parts of the garden. I wonder if it is the wrong species. We haven’t had many butterflies in September. Usually the sedum are smothered in them. I have no idea why! I’ll have to post about another autumn-flowering evergreen next week. It does, and it is lovely Tina. Just remember it may spread! Cathy that is a perfect plant…pretty blooms and wonderful foliage..and it doesn’t seem fussy either! We haven’t even had a frost yet, but then you never know what tomorrow may bring… 25 years ago Michael Fish swore there was not going to be a hurricane, so I got on a channel ferry….. what a nightmare! LOL! and … you got me almost, I was wondering: “alpine mountain” or “white plant” post? They are quite dainty, aren’t they! I like the dainty look of these. You did get me, but not the way you thought. I read your post title as Autumn Show, and expect foliage! Well, I will post some pretty autumn foliage soon as well – I bet it’s looking pretty in Maine now! Pretty flower! I agree with you it is cute that the spikes all curve in the same direction but odd all the same. How do they know which direction to turn to? I suppose they are looking for the sun! (Or the moon?!) Who knows! Each of these dainty little blooms looks like a wonderful snow-flake. A lovely plant! Yes, they’re very delicate petals! You got me- I said snow!!!! Soon enough. 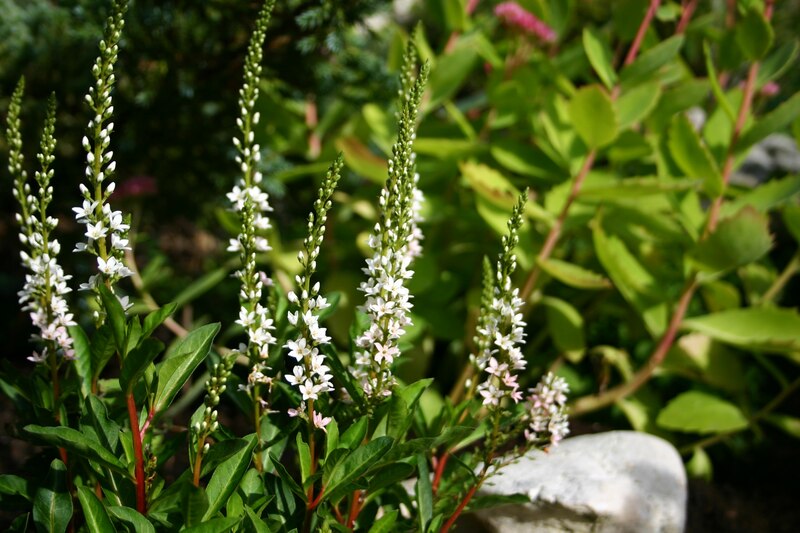 I also have Gooseneck Loosestrife which bloomed a couple of months back. I love the way the neck bends. I have heard it can be quite invasive but that is not my experience. The spot it is in is too dry I think.